Most of us have a number of pharmaceuticals lying around our home, whether for past or present health concerns, or simply as precautions or preventative measures. Most people have a dedicated medicine cabinet in their home, or a special area where they tend to keep their pharmaceuticals. They can start to pile up after a while, especially if you are buying things to deal with colds, flus, and other common ailments, and don’t end up using everything in the package. Below are four tips for storing pharmaceuticals. If you are planning on putting your old, or unused (but still good) pharmaceuticals into a self storage unit, a unit with climate control really is a must. Most pharmaceutical products come with temperature requirements for safe storage, and having a self storage unit with the ability to control the temperature and humidity will ensure your pharmaceuticals remain in good condition for as long as possible. If you have boxes of pharmaceuticals lying around your home and are planning on putting them into a self storage unit, a drive up storage unit will make life a lot easier. Getting boxes in and out of storage can be a major hassle, and the ability to drive a vehicle right up to the entrance of a unit makes moving things so much easier. Drive up storage is the most hassle-free way to store anything, especially bulky items, as it minimizes the distance you have to carry things when bringing them into and removing them from storage. 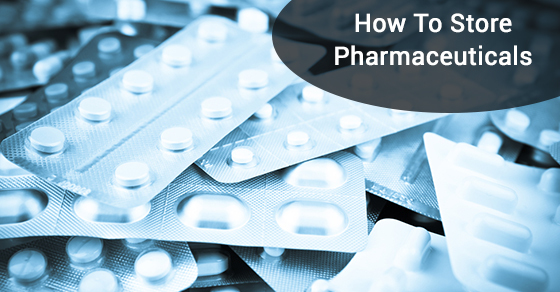 There are some extra precautions that you should take when packing and unpacking pharmaceuticals, given their sensitivity to damage and temperature, as well as their price tag. If you are placing pharmaceuticals into a drive up storage unit and aren’t planning on accessing them until some later date, having the boxes labelled so you know to be extra cautious could save you a headache in the future. Before putting your pharmaceuticals into storage (whether in your home, or off site in a storage facility) it is a good idea to make sure that all bottles and packages are properly sealed. Most pharmaceuticals instruct you to keep the containers air-tight at all times, to make sure the chemical compounds remain effective and active. Storing pharmaceuticals, whether in your home, or in a self storage unit, requires that you pay attention to their specific climate and handling needs. Keep the above pharmaceutical storage tips in mind and ensure that your stored pharmaceuticals remain effective and safe whether you have them close at hand, or at a storage facility close by. What Storage Conditions Are Required For Pharmaceuticals?